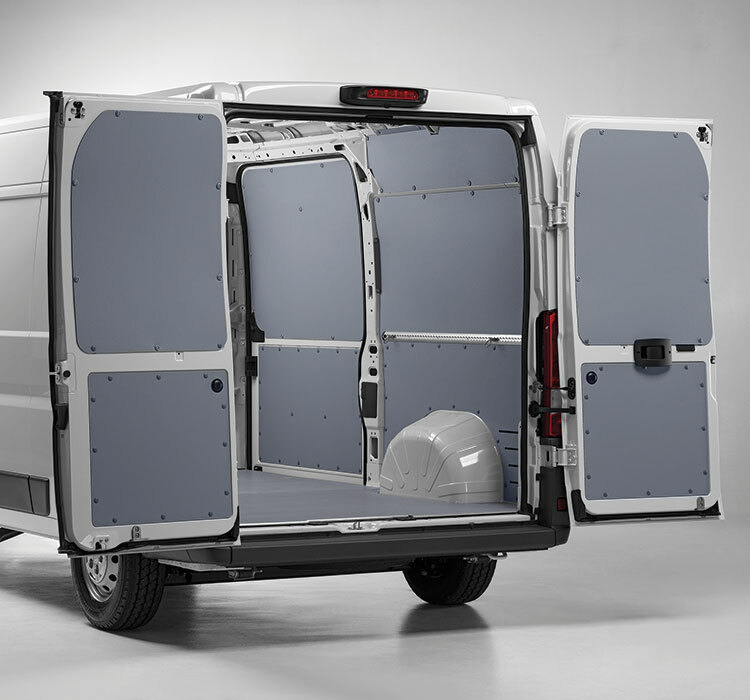 Interior van coverings including panelling and wood flooring with TÜV-certified friction coefficient. 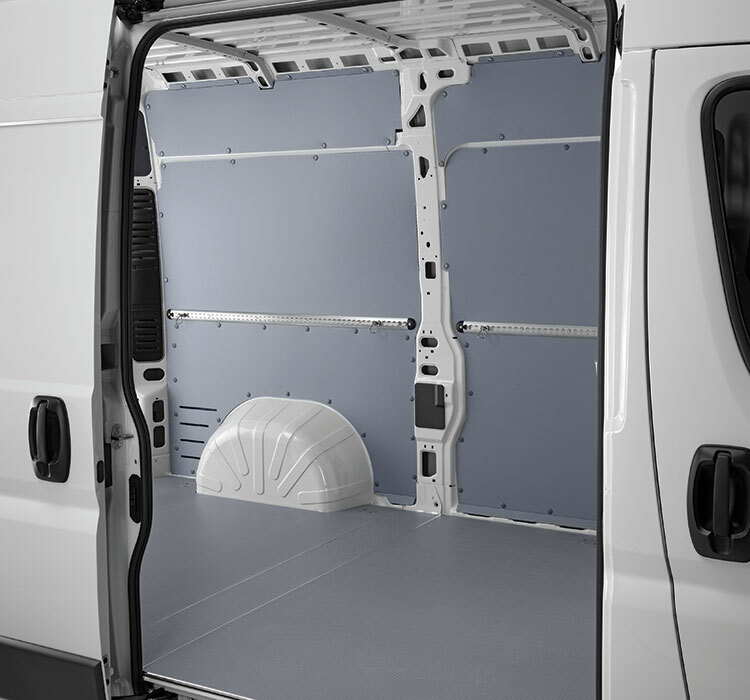 Our Store Van van flooring and interior lining systems with side panelling provide your vehicle’s bodywork with rugged protection against wear and any accidental damage that the transported goods could cause. 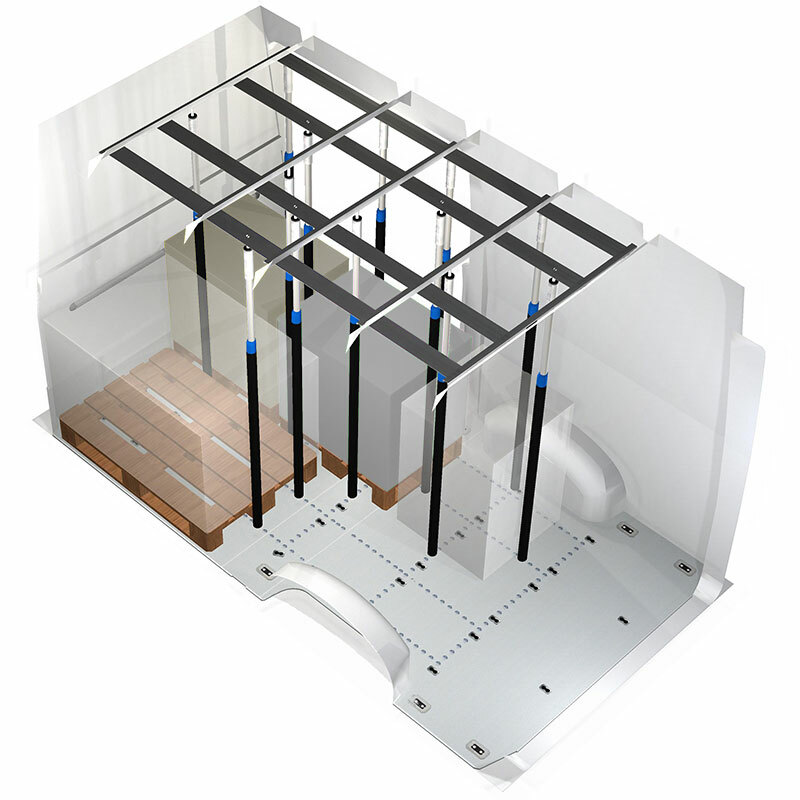 Our marine wood floorings are perfect as a walking surface and sturdy base for anchoring the interior equipment. 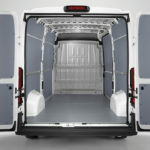 While the sides are protected by polypropylene honeycomb panels, the flooring is in 12-mm thick, all-birch construction (rotary cut) marine plywood. 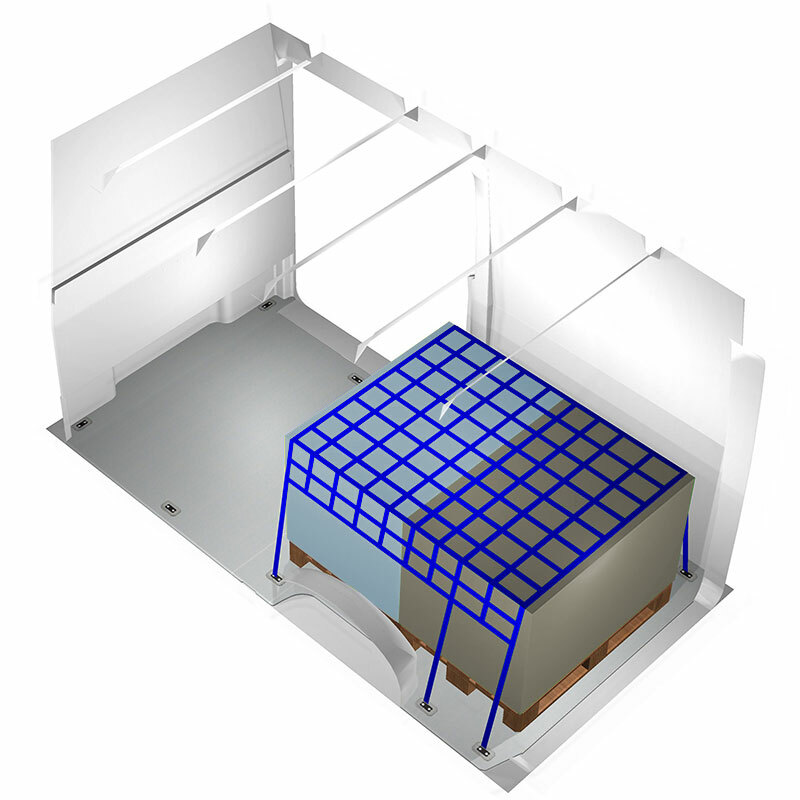 The flooring is then treated with special phenolic resins for moisture and slip resistance. 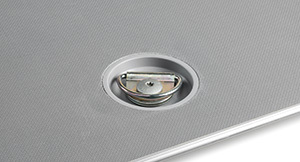 The flooring, which has a TÜV-certified friction coefficient, is fitted with a patented aluminium profile joining system. 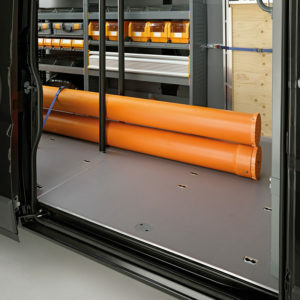 Wood flooring, 9/12 mm thickness, coated with phenolic film and shaped to fit around the vehicle’s original anchor points. 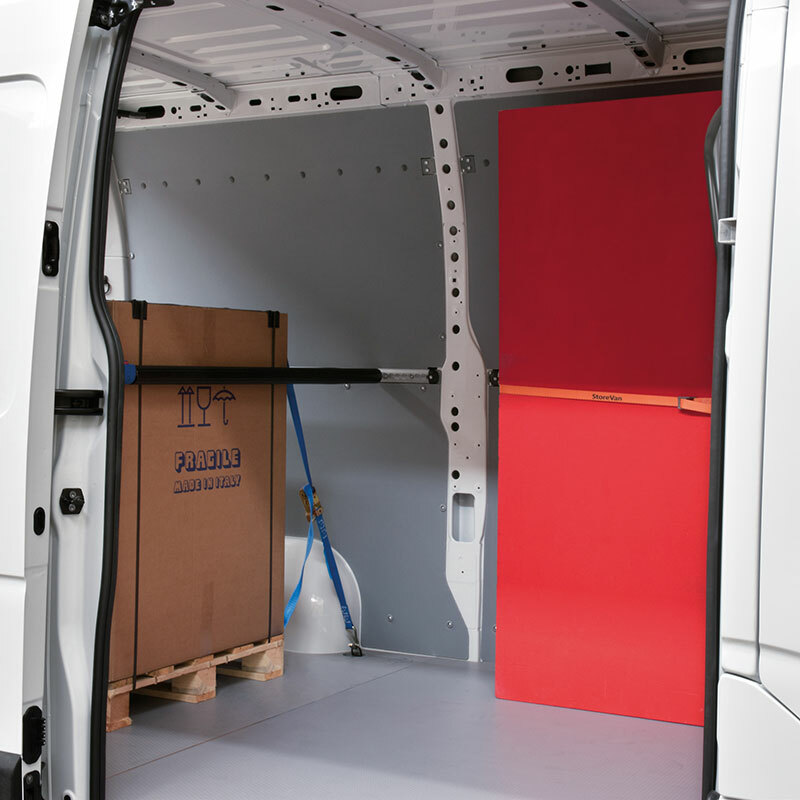 This van flooring was specifically designed for easier anchoring of small and medium-sized items, in compliance with the load securement requirements of directive 2014/47/EU. 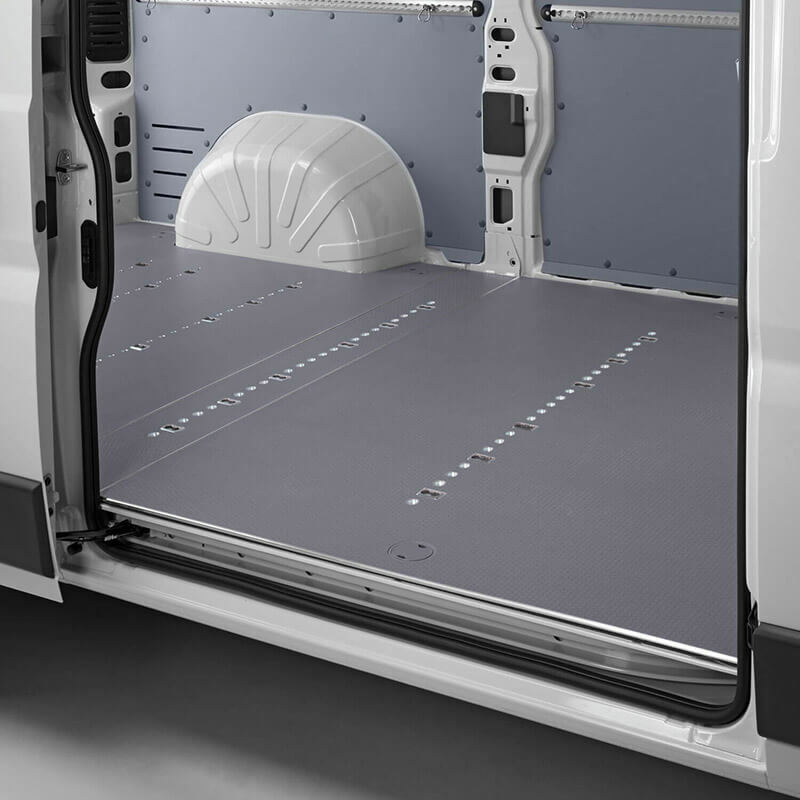 Van flooring with additional, built-in cargo restraint anchor points. Van flooring, 9 mm thickness, that incorporates built-in cargo anchor points. 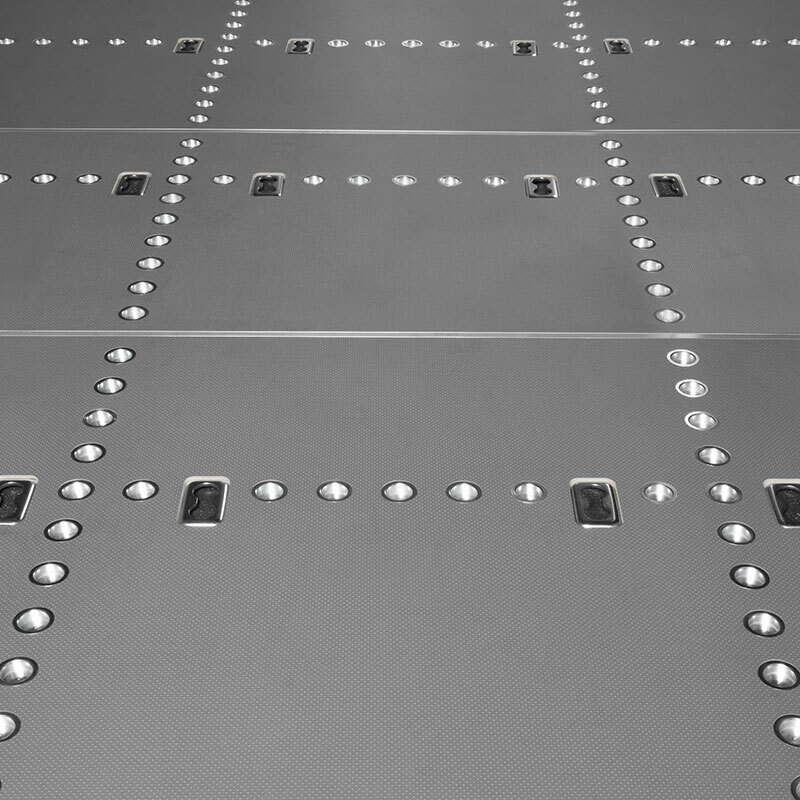 “Airline” anchor points offer a flexible and safe way to secure the cargo to the vehicle floor, in compliance with European directive 2014/47/EU for the highest quality standards. 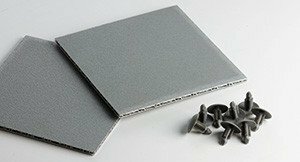 Wood flooring, 9 mm thickness, incorporates built-in anchor points aligned horizontally and vertically. 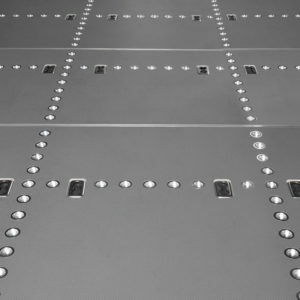 The SAFETY CROSS structure features a combination of anchor points or “Airline” holes that is unique to each vehicle. 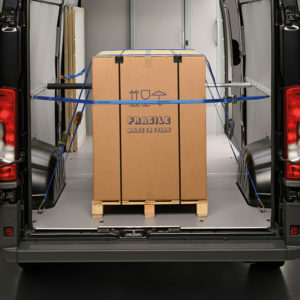 Safely transporting your equipment and material starts with the proper securement of your load. 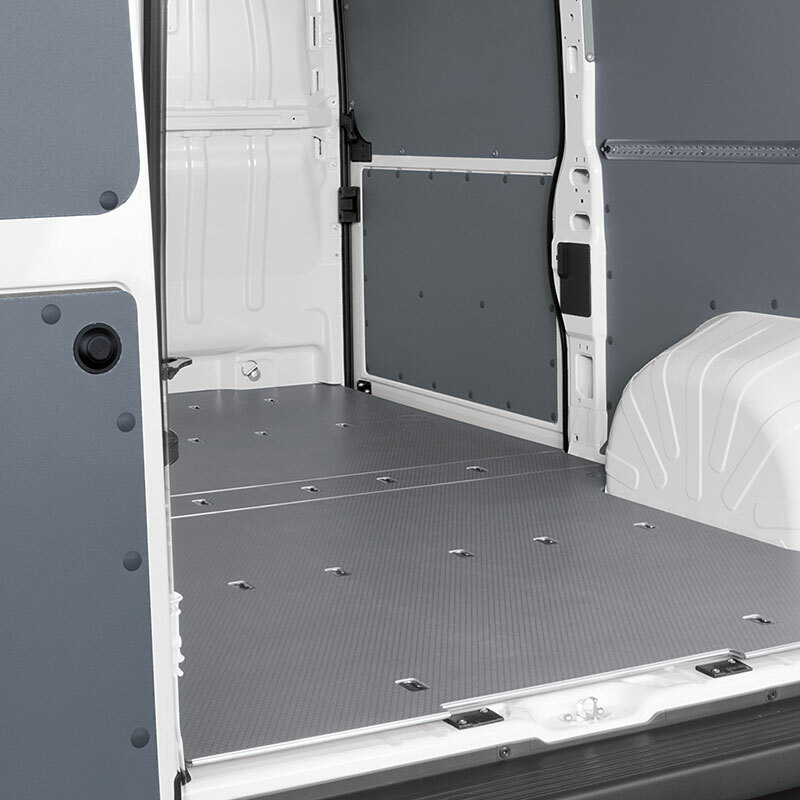 The interior lining of a commercial vehicle is composed of flooring and side walls, which serve to protect the bodywork but also as the foundation for securing the interior equipment. 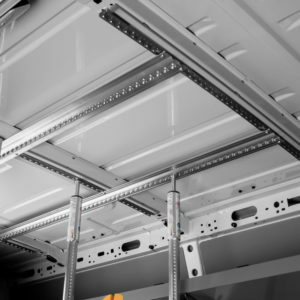 Add to this the needed elements for restraining the goods transported and you’ll have an amazingly unique solution that also ensures a properly secured load. 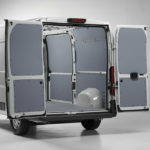 Flexible and safe cargo securing. 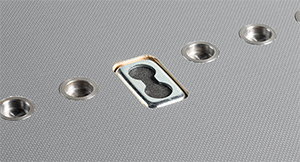 Compliance with directive 2014/47/EU for the highest quality standards. 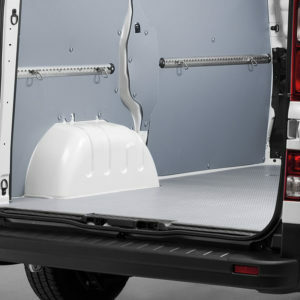 You have the option to enhance your van equipment by adding “Airline” rails to the van’s ceiling or side walls to create securing systems in both a vertical and horizontal direction. 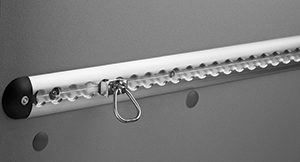 To block the cargo, you can use our telescopic bars, which offer wide range of adjustment, or our cargo restraint straps. 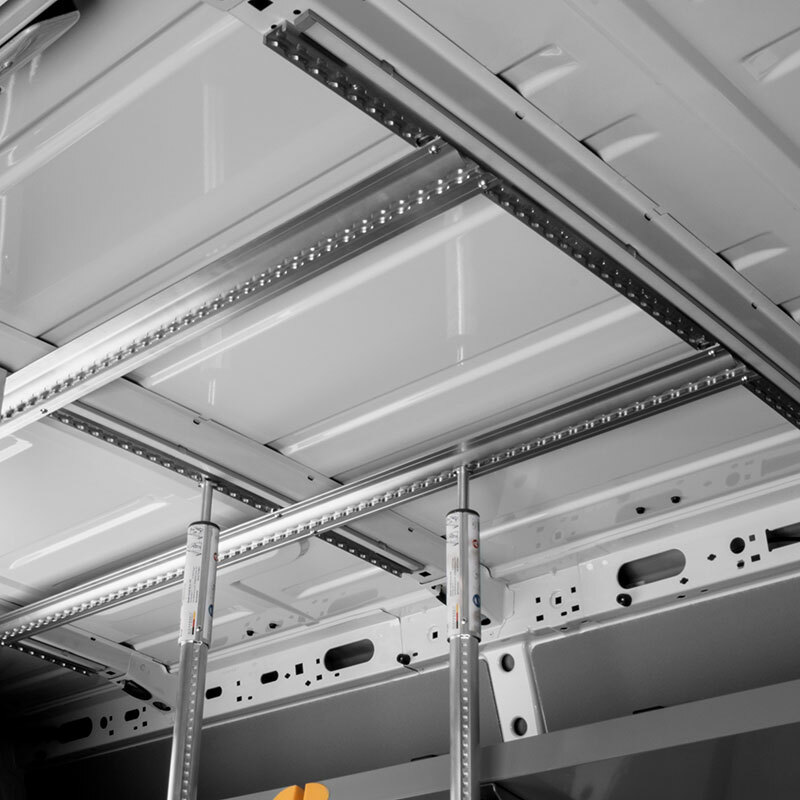 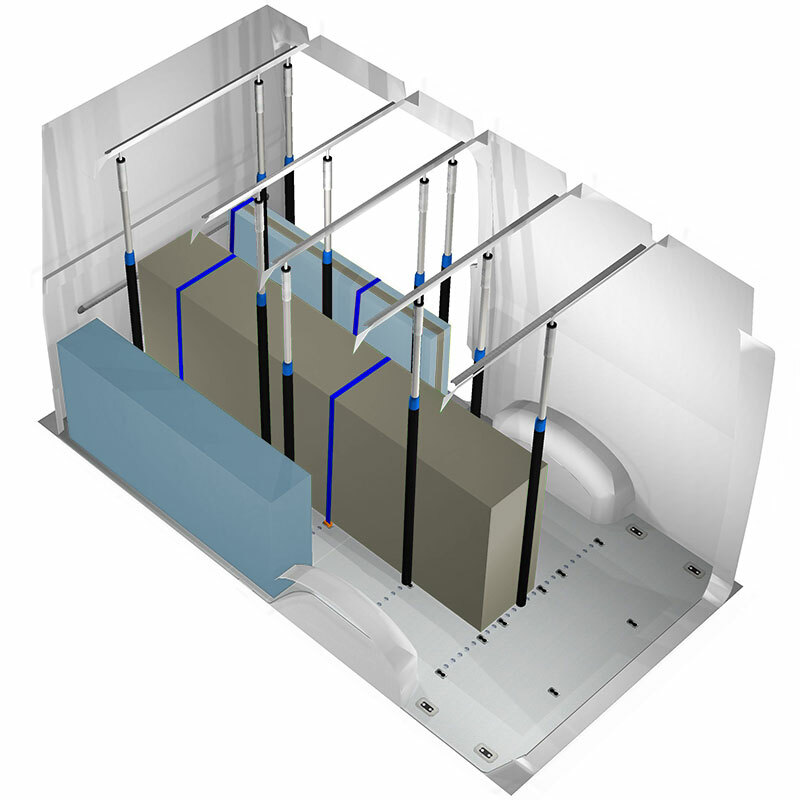 Thanks to this system, your vehicle will be outfitted with a complete solution. 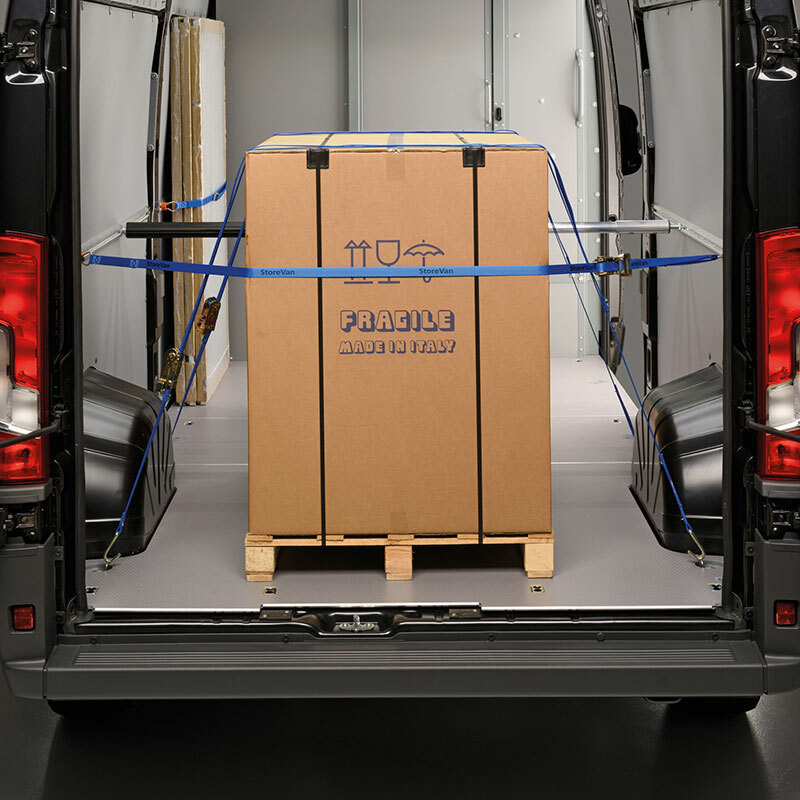 Your load will be restrained in compliance with European regulations, freeing you from the risk of transporting unsecured cargo because you have no way to block it. 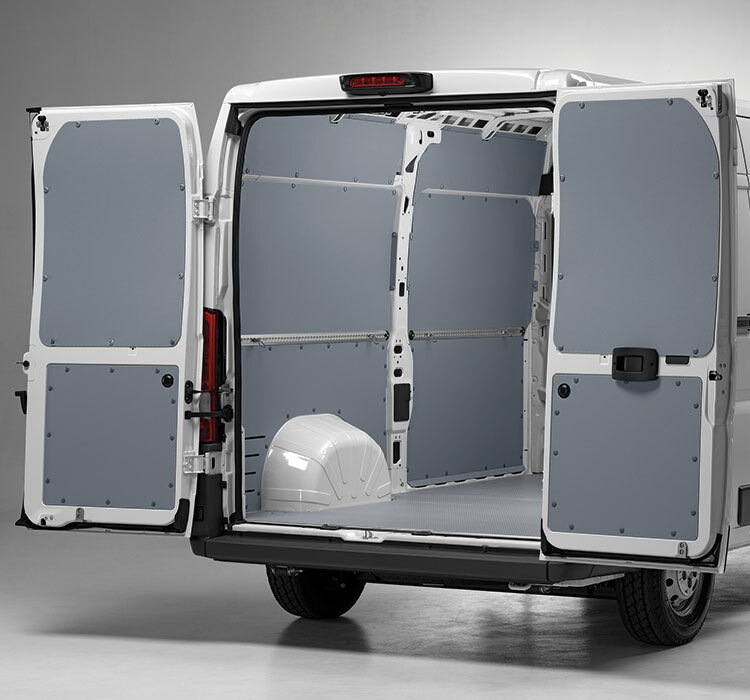 Our HONEYCOMB van panels are produced with 4-mm thick first-rate polypropylene honeycomb sheets, to deliver heavy-duty reliability. 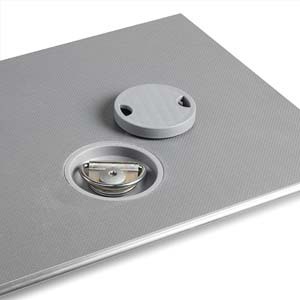 More importantly, our panels offer a custom moulded fit. 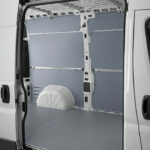 This means they are an exact fit for your vehicle, impeccably lining the walls and doors and protecting the interior bodywork from every possible impact. 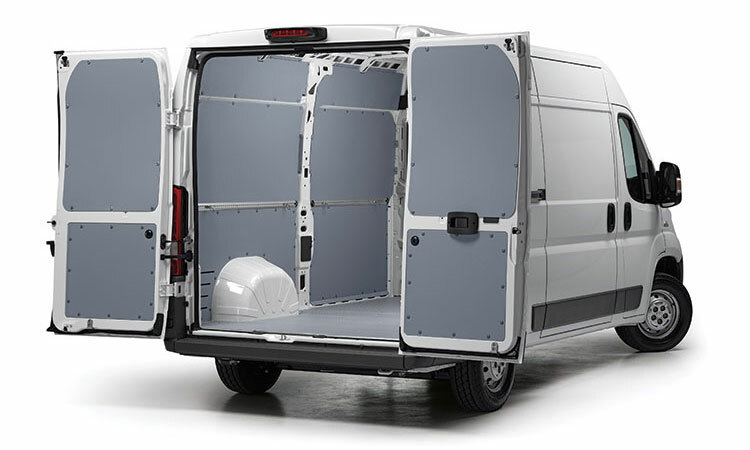 Thanks to a special installation system, the panels are not rigidly attached to the bodywork but adapt to the van’s shape, compensating for any thermal expansion. 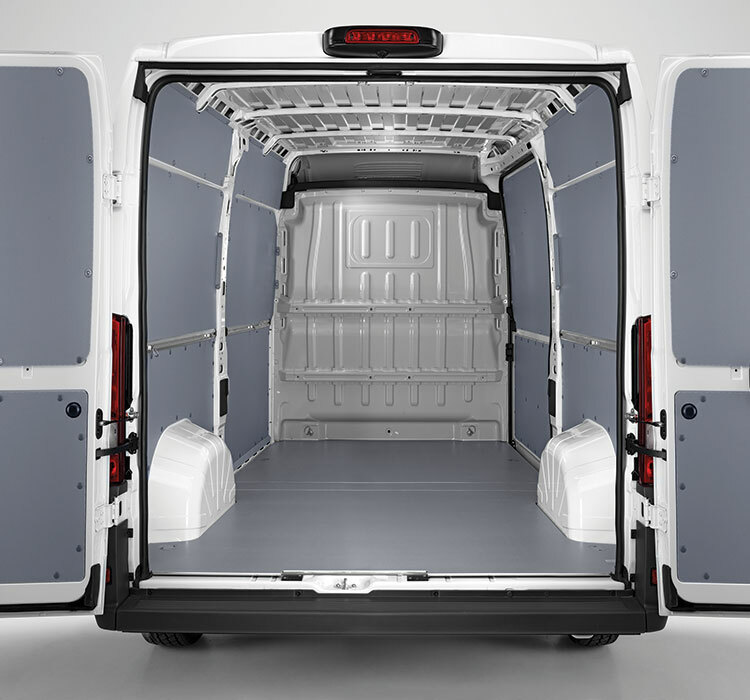 Professional van interior coverings that deliver unmatched benefits: Impact-resistant, lightweight, flexible, washable and recyclable. 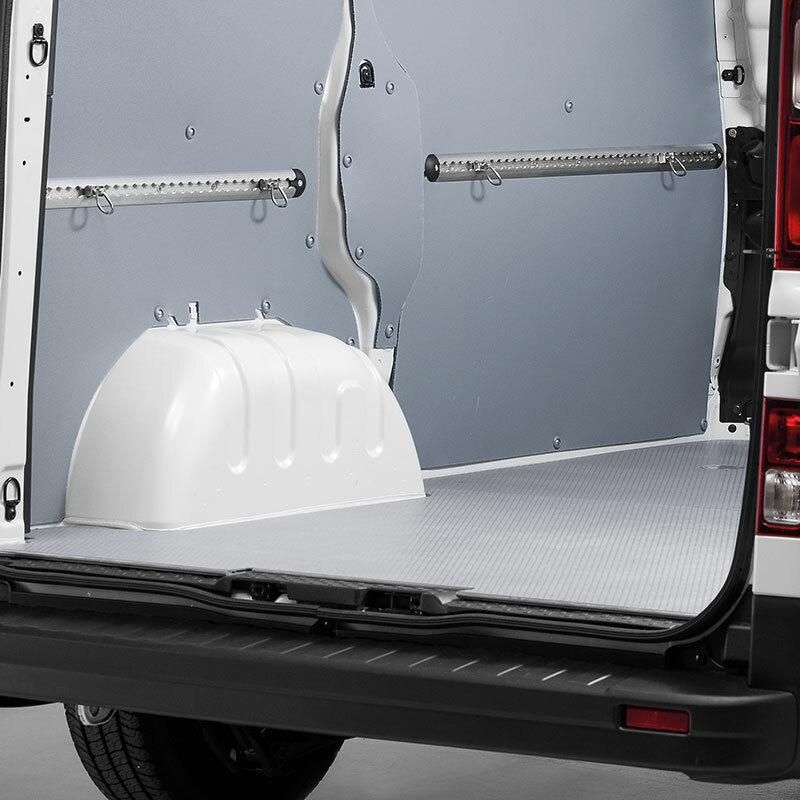 To fix our floors to the the vehicle’s original fittings, they are supplied with polypropylene bucket bolts, screws and washers (where possible). 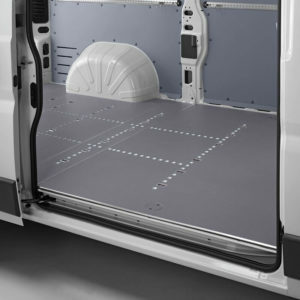 On our SAFETY FLOOR product, specific silicone adhesive is also used to attach the panel to the floor of the van. 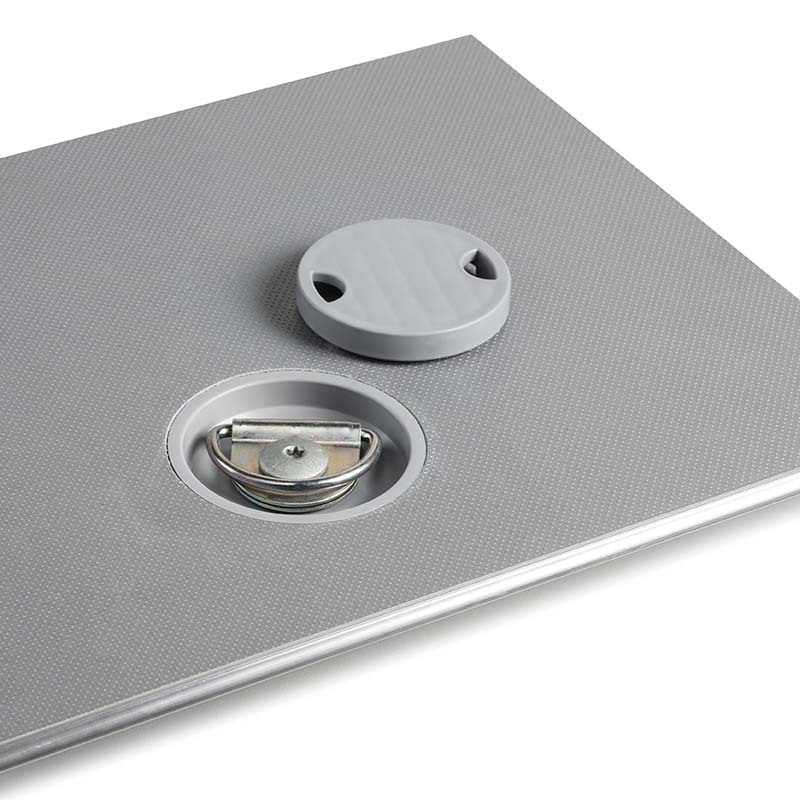 New, patented flexible joining system in aluminium that eliminates imperfections. 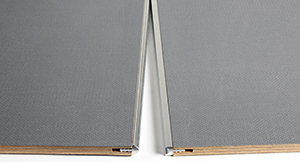 Aluminium edge protectors, with rounded edge as a standard feature, in the back and side of the sliding door. 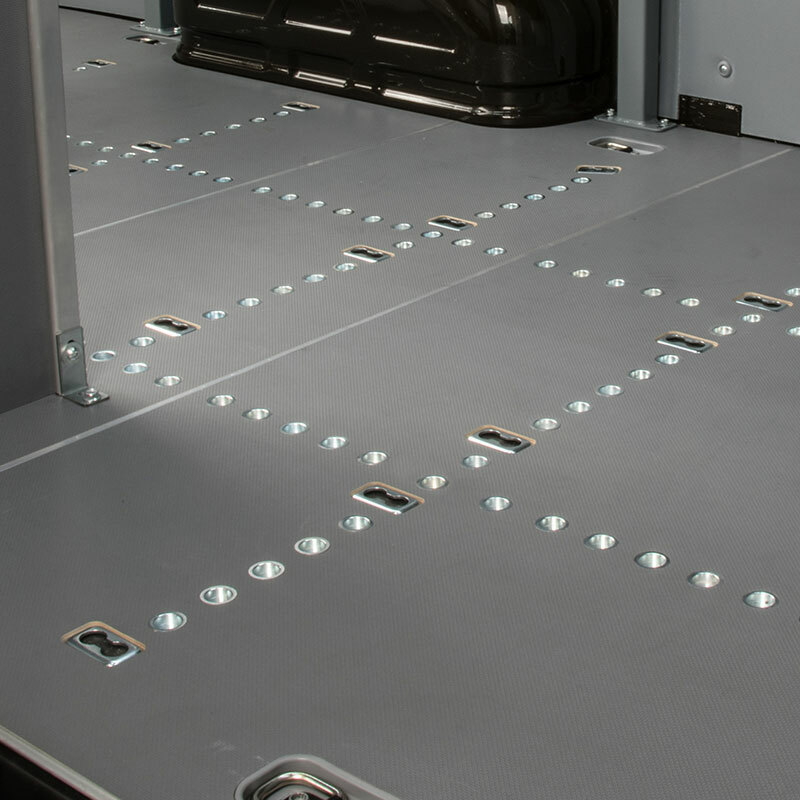 The “Airline” anchor points built into our flooring can withstand a tensile load of up to 200 daN, which is ideal to secure various types of loads safely. Made-to-fit load restraining bars with “Airline” holes to ensure a perfectly secured load and suitable for any need. 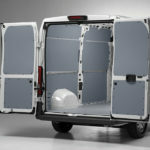 Made from 4-mm thick polypropylene honeycomb sheets. 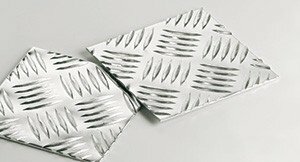 Lightweight and resistant. 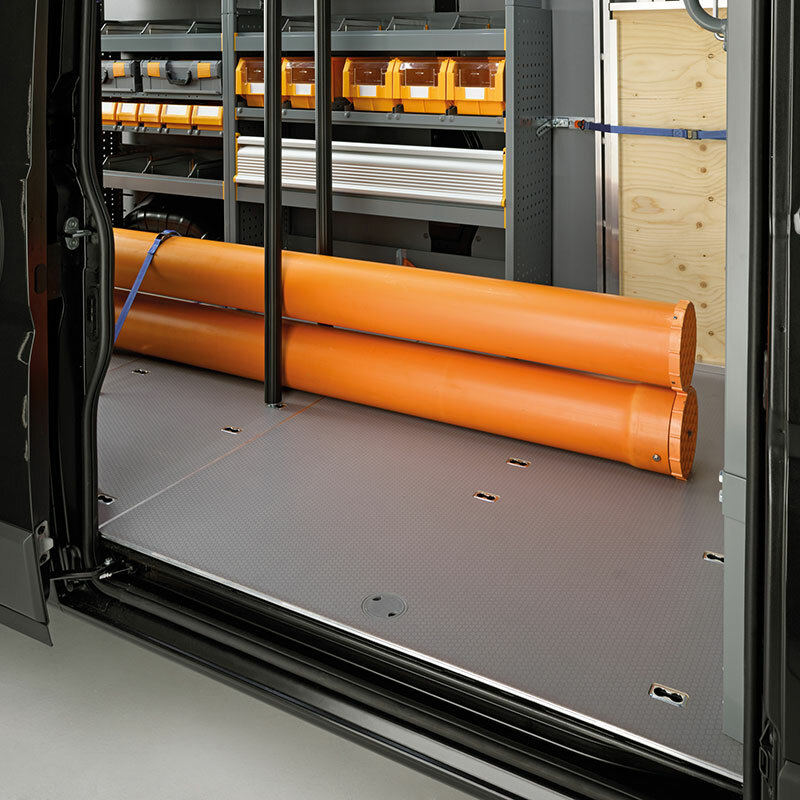 Both the panelling and flooring can be made with anti-slip aluminium diamond plate.